HELP US SPREAD THE WORD ABOUT MemoryMOVES! 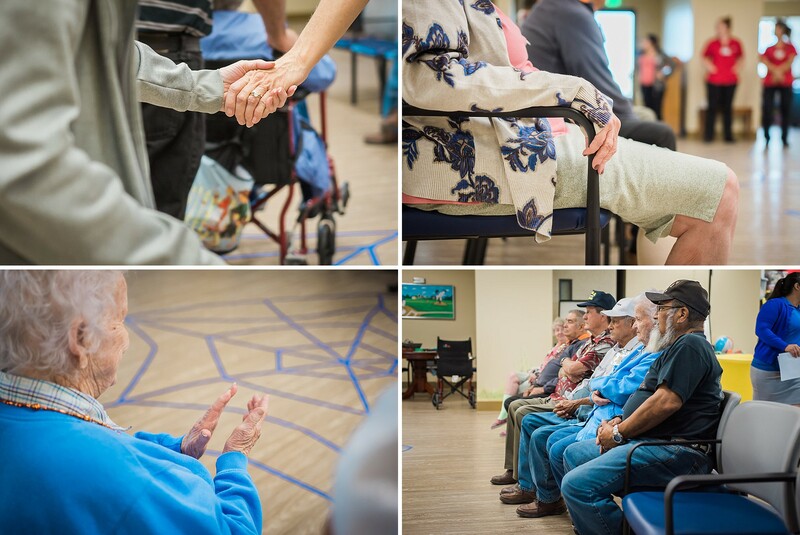 KDA has partnered with the Alzheimer’s Disease Association of Kern County, Inc. (ADAKC) by offering MemoryMOVES: DANCE + THERAPY for memory-impaired clients. In collaboration with registered Dance/Movement Therapist, Elena Rezai, MemoryMOVES will utilize Dance/Movement Therapy as a modality of support and offer clients, staff and caregivers alike, a glimpse into the transformative power of movement. Elena grew up in California and started dancing at the age of 5. She received her BA in Dance from UC Irvine, and went on to receive her MA in Dance/Movement Therapy & Counseling from Columbia College Chicago. She has used her experience as a Dance/Movement Therapist in a number of inpatient and outpatient hospital settings and care facilities, working with people from a diversity of backgrounds and age-groups. She loves building community through movement, and facilitating spaces where movement can foster the physical, emotional and mental integration of the individual. Dance/Movement Therapy (DMT) offers many benefits for individuals experiencing the effects of Dementia and Alzheimer’s and is commonly utilized with memory-impaired patients. According to the American Dance Therapy Association (ADTA) “DMT participation enhances coping skills for this population…compensates for sensory deficits…” and “engages the sensory systems and stimulates the physical, emotional and cognitive areas of functioning.” (ADTA, 2016). DMT helps increase socialization and interaction in a population that can find itself becoming increasingly isolated and frustrated with decreased cognitive abilities. It facilitates mind/body connection, presence, and functional mobility and flexibility, and can help mitigate symptoms commonly associated with Alzheimer’s and Dementia, such as agitation and sadness. Dancing often elicits positive memories, and can help clients recall joyous moments, increasing quality of life and leading to brightened affect. This 7-week program aims to utilize DMT as a modality to support all of the above-mentioned goals, and to offer clients, staff and caregivers alike a glimpse into the transformative power of movement. Additional opportunities will be presented for ADAKC staff and caregivers to learn more about DMT and its benefits, both with those they care for and in their own lives. All DMT groups will take place in the ADAKC main facility in one of the rooms available to clients. Groups generally take place in a circle, with participants facing each other, sitting in chairs to offer stability and balance, although clients may stand up to dance during sessions. 10 minutes: Check In and Body Part Warm-Up. The therapist uses this time to observe each participant’s movement patterns and affect, and may do movement and verbal check-ins, such as asking participants to offer an opening movement or share one word about their current mood. Clients improvisationally warm up every part of their body, keeping in mind that range of motion may be limited. The Dance/Movement Therapist may encourage clients to stretch, make eye contact, or increase range of motion during the warm-up. This forms the majority of the session, and is used to address specific goals of the session through movement. The therapist may utilize a number of DMT modalities to support goals, such as use of props, improvisation, use of rhythm and repetition, and a combination of dance and verbal processing. The therapist will facilitate a body cool-down and closing, that will include breath-work and consciously slowing down movements to bring the group to a natural close. Movement and verbal cues may also be used, such as asking each participant to share a closing movement or positive word. Supporting DMT modality: Effort modulation*, use of props. Supporting DMT modality: grounding, orienting to time/space through movement. Verbal identification of mental process while moving. **All sessions will support all of the above goals, although specific sessions may focus more on one particular goal. Give Big Kern- SUPPORT KDA!